Today, I went to my first yoga class in months. True living lies in surrender to uncertainty. We can plan all we want, but in the end, our lives will take twists and turns for which we could have never been able to foresee. My fears about my future being 'uncertain' are a straw man with no real substance. Why? Because my future never had any certainty, even when I thought it did, and the certainty I thought I had was looking rather bleak. Being out on the edge is as honest as you can get with life. 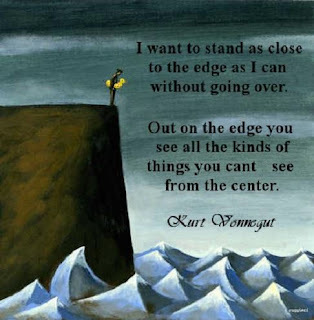 Out on the edge is where you are open to discover your passion, reveal a new talent, and maybe even find the love of your life. The most rewarding experiences in life carry with them great risk. A new job, a new love, a new baby, a new house... Nothing is guaranteed to not fall apart. The beauty lies in our ability to accept the outcome, and if need be, learn to rebuild. So often the word "uncertain" conjures negative connotations in our heads, but uncertainty can bring a world of positive opportunity. We fear "uncertain" because we don't know what's around the bend, but what's around the bend may be exactly what we need- it could be that thing that transforms your entire life for the better. In the end, one of our greatest lessons will be to learn to surrender- to let go- and allow life to offer everything it has to give and everything it has to teach us without imposing what we think 'should' happen. When we surrender, we open ourselves to infinite possibility, and in turn, we make peace with an uncertain path. I really love this post. I'm going to think back to what you've written here when I'm worrying about uncertainty, especially "True living lies in surrender to uncertainty." Words to use as a reminder before taking a deep breath and opening eyes to the view from the edge. It's an every day thing for me... It's hard to put yourself out there and trust yourself in the face of the unknown, but it's AMAZING what happens when you do.